Marketers love swag. It's honestly one of the best parts of going to conferences, whether you just grab a free t-shirt to wear for pajamas or do something more creative with it. Who doesn't love free stuff? Finish off summer in style with your own pair of Uberflips (Get it? FLIPS. Flip flops. It's a pun.). If you prefer keeping your feet warm, grab a pair of socks! Fall is approaching which means SWEATSHIRT SEASON 🍂! What's a conference without t-shirts? Especially, PINK t-shirts! Uberflip's hot pink headbands are kind of a big deal. By the way, that's Ann Handley's dog wearing one. You may not look as good as the dog, but we guarantee you'll look really cool. Complete your (very pink) look with some killer shades. 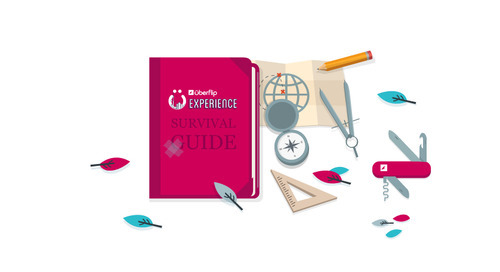 You still have time to get your ticket to The Uberflip Experience! Sign up now. Caitlin is Uberflip’s Events & Communications Manager. When not planning events, she enjoys rap bingo, and her drink of choice is a double gin and soda in a tall glass with extra limes.